I am not a fashionista. At all. Not even in the slightest. Yves Saint Laurent probably turned over in his grave last night when I showed up to the exhibition wearing a tank top, jeans, and tennis shoes, with my hair in a loose ponytail and not even wearing makeup. I do not keep up with fashion, unless you count the fact that I am an avid viewer of “Project Runway.” There is nothing I can say that will contribute to or critique fashion in any way. However, my appreciation lies mainly in the making– the craft, if you will– of fashion. I love looking at the folds of the fabric, the seams between the panels, the interaction of the colors, and thinking about the genius involved in achieving its effects. Yves Saint Laurent: The Retrospective was a pretty BFD for Denver because it was the only American city chosen to exhibit such a large quantity of Laurent’s work (which is according to this review by The Denver Post, which states that this exhibition featured over 2,000 pieces. We’ll have to take her word for it because I wasn’t counting, but I’m guessing photographs, color swatch pages, and the various items used to make up studio and designing “stages” are part of the number count). I read that each dress came in its own climate-controlled crate, and knowing a few things about art shipping means that this factoid has officially blown my mind. Seriously, mind = blown. Equally amazing was the effort in actually setting up the exhibit, since clothing can be rather tricky (also an area I know a thing or two about). YSL follows on the heels of the revolutionary Alexander McQueen show at the Met last summer, solidifying the art museum’s position in exhibiting fashion as art. It looked at Laurent’s creations from his entire career, from his Dior days to his 2002 retirement, and his continuing influence on contemporary fashion is clear, particularly with the pantsuit. I could have sworn that Diane Keaton was hiding amongst the mannequins. The amount of detail that went into his designs was staggering. I was enamored with the beautiful beadwork, the appliques, the wide array of fabrics, and the way that the pieces accentuated the female body. The mannequins were shockingly thin and seemed to be modeled after the anorexic body of the 1970’s, but all were creatively posed, which reminded me of the McQueen show’s mannequins (though those were arguably somewhat more visually interesting). Entry into the exhibition was timed due to high demand, and Aaron and I barely made it in time for the 7 pm slot. It was extremely crowded, and we had to slide past a lot of people in order to move faster than the audio-tour pace. One of the benefits of being an intern was that I was able to get into the VIP/Member line with my DAM badge. The exhibition space was designed to corral people in an orderly direction, which I both appreciated and resented because I wanted to have more space to interact with the pieces, but at the same time, I know they had to design it that was in order to keep the crowd moving in one direction as opposed to hanging around one big room. The lighting was dark and colorful, full of blues and reds, which was absolutely beautiful and added to the mystique of the show. Like most exhibitions, there were themed sections: the Dior years, the black tuxedo wall, signature pieces that defined the course of his career. The two aspects of the exhibition that I was most interested were the art-inspired pieces and the culturally-specific pieces (i.e. Africa, Spain, etc). His “Hollywood classics” were gorgeous, but they were so catered to an upper echelon clientele (which pretty much all of his work was anyway) that I did not connect with them as much. Art-wise, a few of the pieces were blatant references to Mondrian, Picasso and Van Gogh. I loved his reinterpretation of these works to fit a female body. The Mondrian dress is of course a classic mod dress, and his Van Gogh blazers were simply amazing, though unfortunately extraordinarily fragile judging by the fact that they had to be kept flat on vitrine-covered pedestals. The cultural pieces seemed to be a bit essentialist, which I can attribute to the fact that Laurent rarely ever traveled and probably did not actually see the women and their clothing in the proper cultural context, but I can also appreciate his effort in bringing these ideas (many of which were non-Western) to the forefront of fashion. The fact that this is probably the biggest exhibition to ever come to the DAM is all well and good, but perhaps the most admirable aspect of the exhibition is the educational one. 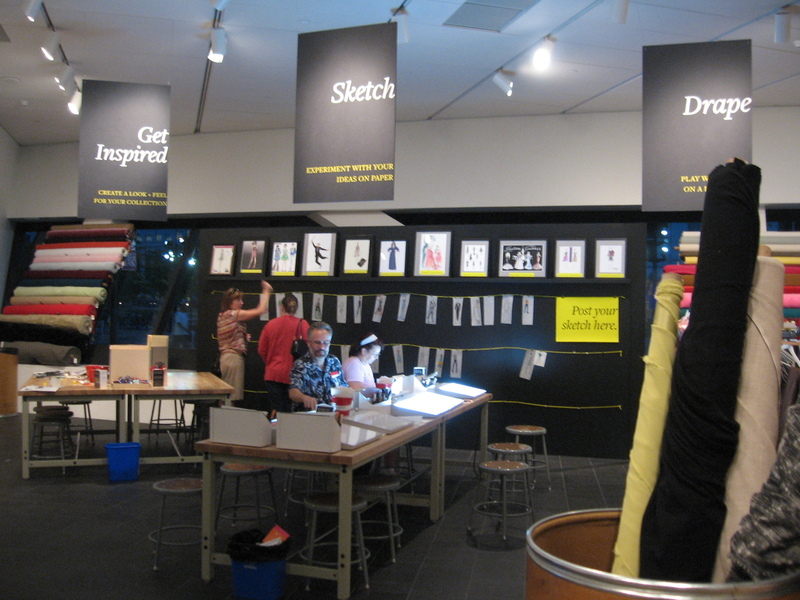 In the first floor of Hamilton there was a whole room dedicated to designing your own creations. The museum has really connected with the local community as well with a wide variety of events, including working with the Children’s Hospital to give some very lucky children the opportunity to see the show and work with local designers to create their own Yves Saint Laurent-inspired creations, which they later wore in a special fashion show. So! If you’re in the Denver area or are dying to see Yves Saint Laurent, you’ve got until July 8. I highly recommend it, because even if you’re like me and not a fashion person, you can still appreciate his extraordinary genius, creativity, and sheer talent in doing what he did with fabric.